"Should we not mention among our truly noble buildings...the Forum of Augustus...buildings the most beautiful the world has ever seen?" The second of the imperial forums, built to rival that of Julius, the Forum of Augustus and its Temple of Mars Ultor (the Avenger) were vowed by Octavian on the eve of the Battle of Philippi (42 BC), where he avenged the assassination of Caesar, his adoptive father (Suetonius, XXIX.2). Having consolidated his power and then completed the building projects initiated by Caesar, it may not have been until the decade of the 20s BC, when Augustus had negotiated the return of military standards lost by Marcus Crassus to the Parthians (Dio, LIV.8.3), so avenging Rome a second time (Ovid, Fasti, V.595), that clearing the site and laying the foundations actually began. Or it may have been somewhat later still, in 17 BC, when Augustus, having "commanded those who celebrated triumphs to erect out of their spoils some monument to commemorate their deeds" (Dio, LIV.18.2), set the example, himself. The site was on private property and had to be purchased ex manubiis, that is, from the spoils of war in Spain and Germany, Dalmatia and Egypt. Augustus, in the Res Gestae (XXI), relates the cost to have been a hundred million sesterces. Even then, not all the land could be acquired. There also were architectural delays (Macrobius, II.4.9), and the temple still was unfinished when the forum was dedicated on 2 BC. The rushed dedication may have been to celebrate the ludi Martiales, games which Ovid, who may have witnessed them, says took place on May 12. Too, it may have been associated with the assumption of the toga virilis by Lucius, the younger grandson of Augustus, which took place that year, and for whom he had dynastic aspirations. To commemorate the event, 260 lions were slaughtered in the Circus, and 36 crocodiles killed in the Circus Flaminius, which was flooded for the occasion, as well as gladiatorial displays and a mock naval battle recreating Salamis (Dio, LV.10.7-8; cf. Velleius Paterculus, II.100). 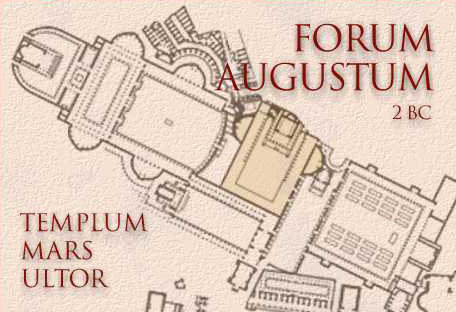 Just as Caesar had constructed his own forum to relieve the congestion of the Forum Romanum (Cicero, Ad Atticum, IV.16), so the Forum of Augustus was built to provide additional space for the law courts, where criminal prosecutions and the selection of jurors were to be held (Suetonius, XXIX.1-2). But Dio, in his list of activities decreed to take place in the forum, makes no mention of courts and regards its purpose as provincial administration (LV.10.2-4). It was from there that military governors ceremonially departed and returned, triumphatores dedicated symbols of their victory to Mars, and recovered standards were to be dedicated. There, too, the Senate was to deliberate on war and the awarding of triumphs, and young men to assume the toga virilis, signifying their coming of military age. Once, holding court in the forum, Claudius is said to have left the tribunal when he smelled the sumptuous feast of the Salii, a brotherhood of priests who were celebrating the conclusion to the festival of Mars in the temple (Suetonius, Claudius, XXXIII). "honoured the memory of the leaders who had raised the estate of the Roman people from obscurity to greatness. Accordingly he restored the works of such men with their original inscriptions, and in the two colonnades of his forum dedicated statues of all of them in triumphal garb, declaring besides in a proclamation: 'I have contrived this to lead the citizens to require me, while I live, and the rulers of later times as well, to attain the standard set by those worthies of old'" (XXXI.5). One showed Aeneas, the mythical ancestor of the Julian family, fleeing Troy with his father and son; the other, Romulus, the founder of Rome. Each was surrounded by their respective descendants, the Julio-Claudians and the illustres viri of Rome, whose statues had marble plaques recording their deeds to serve as a reminder to all of the standard they had set. Borrowing from Virgil's Aeneid, the decorative program of the forum combined myth and history to construct a new national mythology, one that, instead of looking to the future, was directed from the present back to the past. Dominating the forum at the end of the square was the Temple of Mars Ultor. A bibliographic note: The most thorough study of the iconography of the Forum is Forum Augustum: Das Bildprogramm (1968) by Paul Zanker. A more accessible discussion (in translation) is Zanker's The Power of Images in the Age of Augustus. References: Classical Art from Greece to Rome (2001) by Mary Beard and John Henderson; Augustan Culture (1996) by Karl Galinsky; Martin Spannagel, Exemplaria Principis: Untersuchungen zu Entstehung und Ausstattung des Augustusforums, reviewed by J. W. Rich, Bryn Mawr Classical Review, 2002.03.21; The Power of Images in the Age of Augustus (1988) by Paul Zanker; The Architecture of Roman Temples: The Republic to the Middle Empire (2005) by John W. Stamper. Suetonius: The Lives of the Caesars (1914) translated by J. C. Rolfe (Loeb Classical Library); Appian: The Civil Wars (1996) translated by John Carter (Penguin Classics); Pliny: Natural History (1945) translated by H. Rackham (Loeb Classical Library); Dio Cassius: Roman History (1927) translated by Earnest Cary (Loeb Classical Library); Ovid: Fasti (1936) translated by James G. Frazer (Loeb Classical Library); Velleius Paterculus: Compendium of Roman History (1924) translated by Frederick W. Shipley (Loeb Classical Library); Res Gestai Divi Augusti (1924) translated by Frederick W. Shipley (Loeb Classical Library); Macrobius: The Saturnalia (1969) translated by Percival Vaughan Davies.